For five summers Cameron Davis has attended Camp Accomplish. 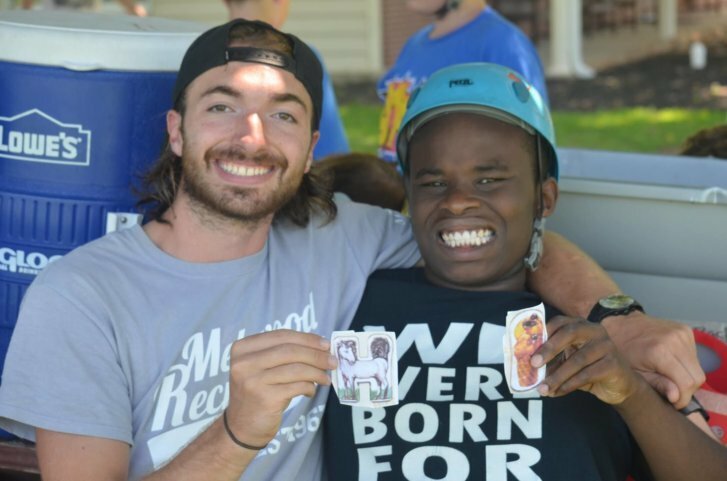 Cameron, who has cerebral palsy and right-sided hemiplegia, thrives at camp. He creates new memories in a beautiful setting alongside other kids with, and without, special needs. For five summers Cameron Savage, age 15, has attended Camp Accomplish. It’s one of the few places where accessible activities and a supportive environment have allowed him the freedom to be himself. Cameron, who has cerebral palsy and right-sided hemiplegia, thrives at camp. He creates new memories in a beautiful setting alongside other kids of differing and typical abilities. In a series of weeklong summer camps, Melwood provides a wide range of inclusive activities that allow children of all abilities to expand their world. On an idyllic 108 acres in rural Maryland, paved pathways, ramps, accessible bathrooms, and other accommodations make it easier for campers to focus on fun. Children can take advantage of the many sports fields, participate in scavenger hunts, and be part of the equestrian, aquatics and nature clubs. They attend classes in the creative arts, cooking, and horticulture and can also challenge themselves in the high and low rope courses, the climbing wall, and the zip lines. Mary Babiarz’s son, Gerik, was nonverbal and lacked social skills before he came to Camp Accomplish more than 10 years ago. Over the years, Gerik’s camp experiences – making friends and getting involved in the many activities – led to a significant improvement in his grades. For the first time, Gerik made all A’s in school and now aspires to major in theater in college. Camp Accomplish is accredited by the American Camp Association. Facilities can accommodate up to 65 children for each week’s day camp, and 30 at overnight camp. The ratio of counselors to campers depends on the needs of the camper, up to a 1:1 ratio. Sessions fill up quickly. Please consider donating to Melwood’s Camp Accomplish scholarships so other children can find joy and confidence through new experiences. Donate here. Melwood is one of the largest employers of people of differing abilities in the country, employing more than 1,600 workers – nearly 1,000 of whom are people of differing abilities. Melwood offers job placement, job training, life skills for independence, and support services to more than 2,200 people each year in DC, Maryland, and Virginia. Melwood also has an inclusive summer camp program for children and provides employment and support services to veterans and active duty military members who have experienced service-related trauma or injury. For more information, visit www.Melwood.org.